The Shelob Attacks Lord of the Rings LEGO set comes with an awesome Gollum mini figure, Frodo Baggins & Samwise Gamgee as well as a formidable Shelob spider to build. The Shelob Attacks Lord of the Rings LEGO set was one of seven sets released in May 2012 in this theme. The set includes a cool Gollum mini figure, which is exclusive to this set and will be sought-after by collectors as well as the two companions, Frodo Baggins and Samwise Gamgee plus an awesome Shelob Spider to construct. Here I will show you the three mini figures contained in this pack and point out their good and bad features as well as highlight the Shelob spider with spider's silk. Enjoy taking a look at this Lord of the Rings LEGO set and please leave any comments you wish to make at the end. 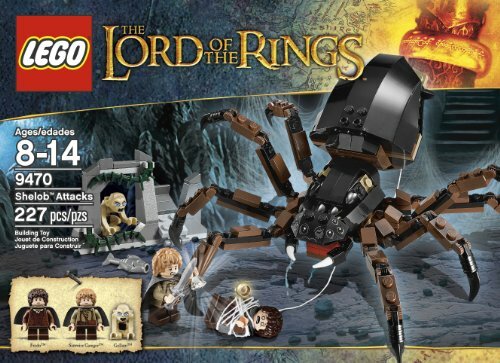 The Lord of the Rings LEGO Shelob Attacks set is designed for fans to recreate the scene where Gollum betrays Frodo and Sam to the giant spider Shelob. This is a nice little set at a good price but most fans will want to buy it for the Gollum and Sam mini figures which are exclusive to this set at the time of release. The Ring and Light of Ëarendil are also nice additions to this set. 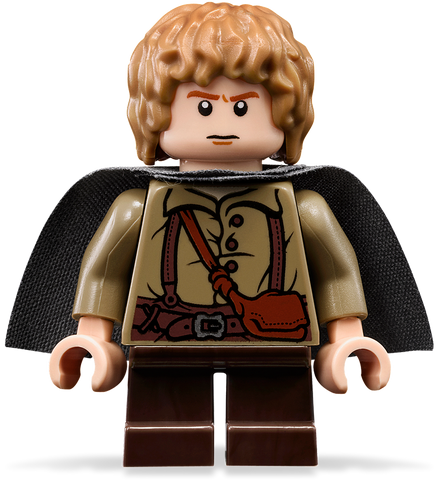 This is one of the least expensive sets in the Lord of the Rings LEGO theme and getting it is currently the only way of completing the Fellowship of the Ring with Samwise Gamgee. • Gollum mini figure is exclusive to this set on release in 2012. • Face and head printing gives Gollum an authentic look with snarling mouth, wide eyes and wisps of hair. • Moving arms for grabbing his "precious" and fish. 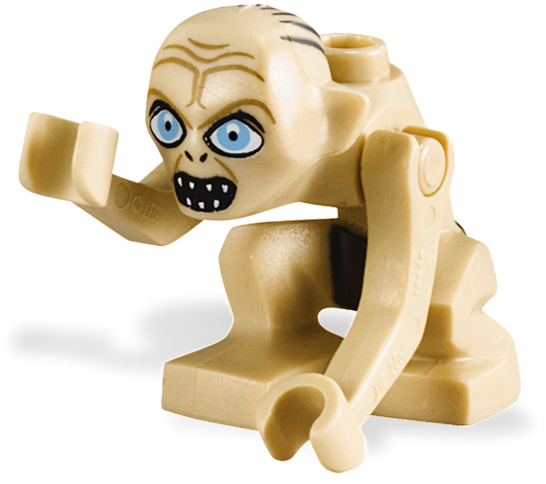 • First ever Gollum LEGO mini figure - it's so cool! • Gollum's legs do not move. • Comes armed with Sting and bearing the One Ring to Rule Them All. • Nice body printing and cape recreate accurately Frodo's clothing. • Short Hobbit stature makes him shorter than Elves, Orcs, Uruk-hai and Men. 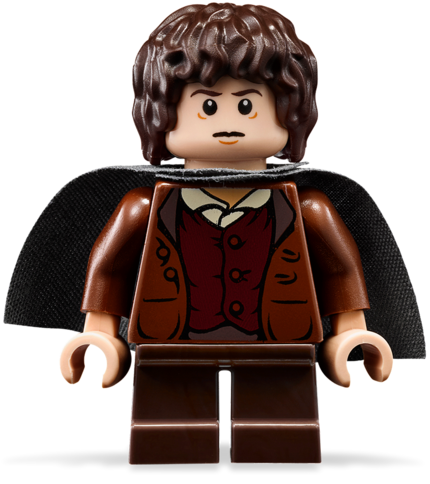 • Double-sided face printing gives Frodo a heroic look and a stung look. • The same as the Frodo Baggins in the Attack on Weathertop set. • The Sam minifigure is exclusive to this set on release in 2012. • Detailed body printing gives Sam a cool look and includes his pouch which contains Lembas bread. • Cool Hobbit hair piece. • Grey cape completes Sam's outfit. • Comes armed with Light of Ëarendil and short sword. • Double-sided face printing gives Sam an angry and scared expression. • Short legs cannot be moved. This is in common with all mini figures that use short leg pieces. It would appear that most Shelob Attacks sets come with not one but at least three pieces that represent the "One Ring to Rule Them All" as well as a few other extra pieces. The video review below shows the Shelob Attacks Lord of the Rings LEGO set in close up, including the mini figures and comments on the pricing and quality of the set. Gollum leads the Hobbits, Frodo and Sam through a maze of caverns into the lair of the giant female spider, Shelob, so that he can steal the One Ring to Rule Them All from Frodo's corpse. But, Sam, armed with Sting and the Light of Ëarendil, is there to kill Shelob and save Frodo from his fate. Shelob is a tricky and slightly fiddly item to construct but looks really cool when completed with eight moving legs, a moving abdomen with spider silk for capturing victims and grabbing jaws. The eight legs use LEGO technic parts to make it stable when finished and so that it can be put into a variety of poses without it falling over. The combination of black and dark brown pieces really make Shelob look like a spider and the printed eye bricks with one damaged eye are a really nice touch. All-in-all this is an excellent model which has a quite high level of playability but does not fit in well with other Lord of the Rings sets and it is a shame that this LEGO Shelob does not have a stinger. 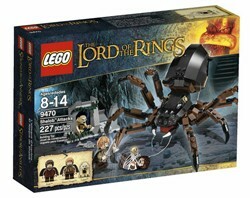 What do you think of the Shelob Attacks Lord of the Rings LEGO set? I think it is really cool. Mine has already been ordered. It looks good, I love the mini figures. I like the mini figures but I think I will buy something else. Not one of the best Lord of the Rings LEGO sets. The scene in which Gollum leads Frodo and Sam into the lair of Shelob is featured in the book of "The Two Towers" but in the movie of "The Return of the KIng". The scene is where Sam really grows into a hero, first fighting off Gollum and then Shelob the giant spider who has already stung and paralysed Frodo. Sam manages to fight off Shelob but believes that he is too late to save Frodo so he becomes the Ring Bearer. Watch the Shelob Attacks scene from the movie on the left. The Gandalf Arrives Lord of the Rings LEGO set features a Gandalf the Grey mini figure in his horse-drawn cart full of fireworks as well as Frodo Baggins of the Shire. The Orc Forge Lord of the Rings LEGO set features 2 Orc and 2 Uruk-Hai mini figures as well as a cool forge where Uruk-Hai warriors and weapons are made. This Attack on Weathertop Lord of the Rings LEGO set features a Weathertop stone fort building and five mini figures; 2 Hobbits, 2 Ring Raiths and Aragorn as well as two horses. The Uruk Hai Army Lord of the Rings LEGO set features six exciting mini figures - 4 Uruk Hai and 2 Rohan soldiers - as well as a small piece of castle wall and working ballista. The Battle of Helm's Deep LEGO features the Helm's Deep fortress and eight mini figures; 4 Uruk-Hai, Aragorn, Gimli, King Theoden and Haldir. The Cosmic Cube Escape Iron Man LEGO set comes with a superb Iron Man mini figure as well as Hawkeye. There is also a Loki minifigure and a SHIELD vehicle for him to steal. A total of twelve mini figures come with this Battle of Naboo Star Wars LEGO 7929 set; 2 superb redesigned Gungans and a force of Battle Droids along with their deployment vehicle. Yes, I think these are going to be very popular particularly with the attention to detail that has been given to making the characters into LEGO mini figures. The Kai's Blade Cycle LEGO Ninjago set comes with the super Kai ZX mini figure and his enemy; Rattla. The other main feature is the awesome giant Blade Cycle.